As you all know there are are tons of critical reviews and jokes about Apple iOS maps. But what is really behind this new technology and why Apple took some monumental risk in doing away with Google Maps? The link below gives a very good review and possible explanation of Apple’s decisions. As I previously indicated in some of comments elsewhere, Google has made it imperative to not allow more features of maps on iOS as they are, on it’s android version. It is using it’s ‘designer’s prerogative’ (in this case the maps API) to snub Apple because of disagreements over not just how to share any Ad revenue but also in terms of aesthetics and appeal. It has intentionally not promoted or enabled ‘turn by turn’ navigation, street view etc on maps on iOS devices to obviously make it look inferior to android devices. I must say this is not a wise decision, given that Apple has sizable base on smart phone market and it is actually dissing lot of the users. So to counter this Apple has a couple of options. One to go with Google and allow it to use the Ad revenue if anything and yet compromise on aesthetics and appeal. It will be forever at the mercy of Google as far as maps is concerned. The other option is to develop it’s own maps technology by acquisitions and better technology. They opted for the later. I this is a wise decision. In the short term it has the problem of missing content (mind you, this not so much about bugs but about missing coverage or mistakes, which can always be made up eventually), but in the longer term better technology always pays off. Some of the features like Vector Maps, Dynamic 2D presentation, 3D perspective views etc are far superior to google maps. Also as maps user before and after ios6 update I see a clear savings in data usage by apple maps as opposed to google rendered maps (I did not measure exactly but it is quite substantial). Also as a result ios6 maps enable more offline maps because in contains more layout info with lesser data for the same buffer space used. No doubt the Apple content may not be upto date, but where it is not so users have alternative apps like MapQuest, Waze or even google maps on web browser. So in this respect Google made a mistake of not supporting maps app on iOS to the extent needed. It is not just Google maps, but apple maps also spells doom for Nokia maps, Bing and other gps apps. Here is the full article. 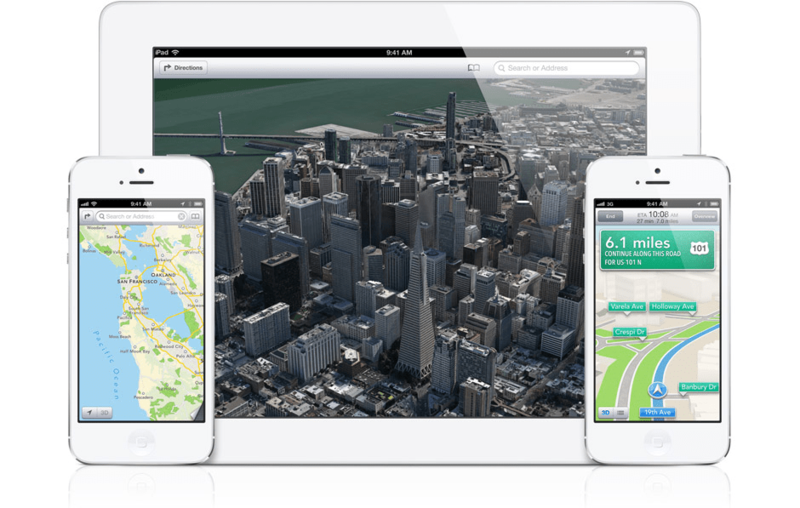 It is a must read for those those who are very critical of apple maps. This article objectively analyzes the options available for this feature and shows where apple lacks in features also.